It’s obvious that awards season is here. Many World Services Group members can be seen front and center, acknowledged for their exceptional work through prestigious industry awards, professional rankings and other notable achievements. This is always an exciting time for the network as these deals and successes further affirm the quality and leadership of WSG members and provide ample opportunities to promote the strength and premier status of the network. As noted by one of our member firms, “Industry awards and rankings are of significant value and constitute an important marketing tool. We ensure that any awards and leading rankings are promoted to our clients, via our website and social media channels for example, as a means of affirmation of the level and quality of our services from internationally-recognised third party sources”. Awards and rankings become part of and contribute to your online presence. Clients searching for firms to hire or firms looking to make a referral will compare your online search results, including accolades, ultimately influencing decisions. Awards attract and retain top professionals. Industry recognition can help a firm stand out as an employer of choice. Awards automatically brand your firm as successful and as an industry leader. 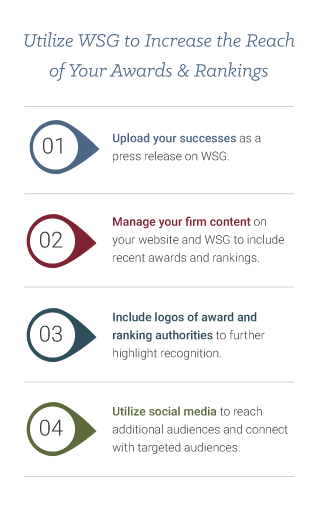 WSG stands behind our strong and distinguished membership base as we only accept the top providers of professional business services. Seeing the many awards received by member firms further supports such objectives. We look forward to continued successes by our member firms, and will continue to promote yours and our brand collectively. Be sure to contact WSG Marketing at 713.650.0333 or [email protected] if you have any questions or suggestions on how to promote awards and recognition.